The more I listen to the negative voices coming out of Washington, the more Iâ€™m convinced that some of these politicians should never have been elected to office to represent America or the publicâ€™s trust. Hopefully, in their re-election bids, voters in their districts will see fit to end their tenure; then the country as a whole will not be subjected to their grandstanding and stupid rhetoric. I am appalled as to how a handful of uncompromising extremist politicians can hold this country and the American people hostage at the risk of shutting down government because they are opposed to the Affordable Care Act (â€œObamacareâ€). The Affordable Care Act passed without a single Republican vote and is the law of the land. It was passed by the Congress and upheld by the U.S. Supreme Court. Yet, Washington Republicans have tried unsuccessfully to repeal the law 43 times. Even though the 43 repeals passed in the U.S. House, they were aware (if they are astute politicians) that their repeals of the law never had a chance of passing the U.S. Senate and would be staring in the face of a veto from President Barack Obama. So why do Washington Republicans keep wasting time on something they know will never happen as long as the Democrats have control of the Senate and Obama is still the president? Are they playing to their political base? Why donâ€™t they spend that time working with the President on trying to get this economy back on track and putting people back to work? If there is a shutdown, 800,000 workers will be forced off the job without pay. In House Republicans’ recent actions to halt Obamacare they suggested withholding funding of the healthcare law which kicks in on October 1st. Then they shifted to a short-term funding bill that would delay Obamacare for a year. Why not a clean stop-gap spending bill to keep government running and deal with Obamacare later? Reportedly, a government shutdown would cost about $2 billion â€“ which at the moment seems more likely than not. President Obama said it would be the â€œheight of irresponsibilityâ€on the part of conservatives to shutdown government, adding that it would cause economic chaos. Whatever happened to compromising? There is a stark difference between demanding and compromising. The clock is ticking away toward Midnight October 1st. Letâ€™s hope that sanity prevails on the part of our leaders who are in positions to make that happen â€“ to halt a government shutdown and keep government running; that the winds of caution, sanity, and responsibility will prevail in the best interest of this country and its people. Washington, DC (BlackNews.com) â€“ The implementation of the Affordable Care Act is an achievement Americans can be proud of. Making sure that all our brothers and sisters, children and grandchildren, have proper health insurance makes us a stronger, more prosperous nation. To become a society with better health – not just better health coverage – we must also look at the role “place” plays in the lives of minority communities. Researchers are releasing â€œCommunity Health Equity Reportsâ€ at the Place Matters 2013 National Health Equity Conference on Oct. 2 in Washington, D.C. Data from Baltimore, Birmingham, Ala., Chicago, New Orleans and other cities demonstrates that where you live is a powerful determinant for how long you’ll live. â€œHealth equityâ€ may sound like a jargon term, but it’s really a simple and just concept: all people should have equal opportunities for good health. People of color – who are still subject to persistent social, if not legal, segregation – are disproportionately located in unhealthy spaces. This is a major factor that helps explain the poorer health of many minority groups. Neighborhood conditions can overwhelm even the most persistent and determined efforts of individuals to take steps to improve their health.Â Neighborhoods with high rates of poverty are subject to significant health risks, from the presence of polluting industries to the absence of a grocery offering fresh fruits and vegetables. A study commissioned by the Joint Center for Political and Economic Studies found that the direct medical costs associated with health inequities – in other words, additional costs of health care incurred because of the higher burden of disease and illness experienced by minorities – was nearly $230 billion between 2003 and 2006. Add the indirect costs, such as lost wages and productivity and lost tax revenue, and the total cost of health inequities for the nation was $1.24 trillion. Dr. Brian D. Smedley is vice president and director of the Health Policy Institute of the Joint Center for Political and Economic Studies in Washington, DC. America’s Wire is an independent, nonprofit news service run by the Maynard Institute for Journalism Education. For more information, visit www.americaswire.org or contact Michael K. Frisby at mike@frisbyassociates.com. Chicago, IL â€“ On Veterans Day, Monday, November 11, 2013, the National Veterans Art Museum (NVAM) will honor Veterans Day with the opening reception of Esprit de Corps, an exhibition highlighting the spirit of creative resilience. Admission to the NVAM will be free from 12 p.m. through 9 p.m. with light refreshments offered from 5 p.m. to 9 p.m. A keynote address will commence at 6 p.m. by Dr. Jack M. Bulmash, Hospital Chief of Staff of the Hines VA Hospital. At 7:30 p.m., patrons are invited downstairs to the Filament Theatre Company for the premiere of Veteransâ€™ Voices, a documentary performance by Erasing the Distance. Esprit de Corps is taken from the French and means â€œspirit of the bodyâ€â€”in military contexts, it refers to group morale, â€œthe capacity of a group of people to pull together persistently and consistently in pursuit of a common purpose.â€ Featuring art by veterans of Vietnam, Afghanistan and Iraq, Esprit de Corps traces the process and roles of therapeutic art from the act of initial perception through expression of experience to an ultimate communal sharing and understanding of the real impact of war. Keynote speaker Dr. Jack M. Bulmash is the Hospital Chief of Staff of the Hines VA hospital. He joined the VHA and Hines VA Hospital on July 7, 2007 as Associate Chief of Staff for Geriatrics and Extended Care after a thirty-year practice in Geriatrics within the private sector. Dr. Bulmash graduated from the University of Illinois with an MD degree and after his internship joined the United States Army serving in Vietnam as a Battalion Surgeon. Veterans’ Voices will be performed on November 11, 12, 13, 18, 19 & 20 at 7:30 p.m. at the Filament Theatre, 4041 N. Milwaukee Ave. The NVAM will be free and open to the public from 10 a.m. through 7:30 p.m. on November 12, 13, 19 and 20. Esprit de Corps will be on display from November 11, 2013 to August 1, 2014. The National Veterans Art Museum is dedicated to the collection, preservation, and exhibition of art inspired by combat and created by veterans. No other gallery in the world focuses on the subject of war from an artistic perspective, making this collection truly unique. The National Veterans Art Museum addresses both historical and contemporary issues related to military service in order to give patrons of all backgrounds insight into the effects of war and to provide veterans an artistic outlet to work through their military and combat experiences. The National Veterans Art Museum is located at 4041 N. Milwaukee Avenue, Chicago, Illinois. The National Veterans Art Museum will be open Tuesday through Saturday from 10 a.m. – 5 p.m. Admission is free. For group admission reservations, call the Museum at 312/326-0270 or visit www.nvam.org. Once again, we stand poised on the precipice of economic calamity because the Republican-led House is intent on creating crises to push their agenda.Â Unfortunately, too many pundits add to Americans’ cynicism by trying to find a way to blame both sides. TheÂ Washington Post recently tried by saying that Democrats hope Republicans will fight to shut down the federal government in hopes of gaining advantage when people figure out the Republicans are to blame.Â Playing to cynics also plays well in portraying this as a school yard fight, which in the age of reality television and voyeurism, is a sales pitch. It however does no one well if the experts and thought leaders do not play honest umpires to call the balls and strikes as they see them. So, here are the facts. This summer, at a fundraiser in Idaho, the speaker of the House, John Boehner, said he wanted to create a crisis out of the federal budget and funding the government. The president clearly stated he would not negotiate on keeping the government in operation, either through a fight on a continuing resolution or raising the debt limit. A continuing resolution is congressional legislation brought about when Congress has not passed budgets for the many government agencies, and so instead passes a resolution to allow the government to continue to operate by authorizing expenditures in one giant bill. To be even clearer, this is Congress authorizing money so the federal agencies can carry out the mandates of the many laws Congress has already passed-laws to inspect meat for safety, laws to prevent illegal drugs entering the country, laws to imprison people who violate those drug laws, laws to create national park lands, laws to ensure people receive their Social Security benefits and on and on. Since the House under Speaker Boehner’s leadership failed to pass those budget laws, the House is now in a position to create a crisis as Oct. 1 approaches; the first day of the new year of the federal budget. The debt is the cumulative effect of past congressional decisions. From 1998 to 2001, the federal government ran surpluses, so the outstanding level of debt fell from $3.77 trillion to $3.32 trillion. This led the Congressional Budget Office (CBO) to project in January 2001 that federal debt would go to zero by 2012. From 2001 to 2008, the federal government ran deficits in part as a stimulus effort directed at the 2001 downturn and in part from funding wars in Iraq and Afghanistan and in part because the 2001 recovery was weak, so revenues were less than expected and expenditures (on things like unemployment insurance and food stamps were higher). This ran the federal debt up to $5.8 trillion in 2008. Many of the tax cuts put in place during that period, and new programs like the prescription drug benefit for Medicare, were left in place by President Barack Obama. By 2011, the debt had jumped to $10.1 trillion. In all, CBO figures that $3.3 trillion less was collected in revenues because of the weak 2001 recovery and the Great Recession of 2008; and spending increased for those same reasons by $112 billion. The programs that Obama inherited account for 44 percentÂ of the increase in mandatory spending that CBO had not anticipated in 2001, and 49 percentÂ of the increase in discretionary spending that CBO had not foreseen in 2001 was already added to the federal debt when he took office. Further, 62 percentÂ of the $2.8 trillion drop in revenue from tax cuts put in place between 2001 and 2008 that CBO could not have accounted for in January 2001 were from policies that preceded President Obama. This means that it would be disingenuous at best, for Republicans to now argue about raising the debt ceiling to insure that the United States pays on the debt incurred for policies made since 2001-debts for policies that included those of President George W. Bush, Senate Leaders Trent Lott and Bill Frist, and Speaker of the House Dennis Hastert. These crises manufactured by House Republicans are designed to bend economic policy in their direction. But, given that so far it is President Obama who has bent, the reality is that the fiscal policy pursued since 2010 and the end of the American Recovery and Reinvestment Act has been declining fiscal stimulus. In the 11 quarters since the last quarter of 2010, the federal government has been a drag on the recovery in all but two because it continues to grow smaller-paying fewer workers and buying fewer goods and services from American companies desperate to grow sales.Â In part this reflects the president’s gambit with the sequestration that Republicans took, shrinking GDP growth by over a point in the fourth quarter of 2012 when government procurement got rolled back in anticipation of fewer contracting dollars. Clearly, these actions take away job opportunities. Republicans have not put forward a new vision for America. Instead, the only problem they see in the country right now is the size of the federal government.Â The persistent high levels of unemployment, the drop in median family income, even the increase in child poverty are not issues they are producing solutions for-except a view that smaller government will solve them. So unlike all past economic downturns, like under Presidents Ronald Reagan or George H.W. Bush, they are testing a new economic theory that a shrinking government will lower unemployment, raise family incomes and reduce child poverty. Except, following their policy of a shrinking government, the opposite is occurring. And last week, the Republican House voted in the face of rising child poverty to cut $40 billion from the Supplemental Nutrition Assistance Program (SNAP-food stamps). Republicans have argued that government debt is a moral issue. But, this confuses saving and investing. It does save money now when you don’t fix our roads or pay for teachers in our children’s classrooms. But that doesn’t save money in the long run. Cutting those expenditures cuts on our investment. It leaves a long and expensive “to-do” list for our children when they must confront a broken transportation system that cannot draw investors to America for fear they can’t move their goods efficiently. It also hurts our children’s education, leaves them less educated and skilled for a world that grows more technical and sophisticated every day. Several Senate Republican leaders see this current grandstanding by House Republicans as harmful to the Republican party. Voters will not be fooled, even if the Sunday talking elite try to make this into a food fight. Shutting down the government, moving America backward and standing for nothing is not a formula to draw votes. With median family incomes still down from 2007, America’s working families do not believe, as some House Republicans, that a private sector led by JPMorgan-and its acknowledgement of multiple counts of law violations, and perhaps $20 billion in fines for corrupting the financial system and causing the collapse of the world’s economy-is the solution. The stock market is booming. The “job creators,” including those like JPMorgan, that face legal charges, have soaring incomes. They are not riding in on white horses with job offers to save Middle America. Wall Street is dancing to music that only the House Republicans can hear, because on Main Street, there is still the silence of looking for work. If the pundits call it honest, this is a big strike for Republicans for playing with the economy again and failing to offer a vision of jobs and rising pay and investing in America’s children. After voting to take food away from the tables of America’s children, this will be strike two. SPRINGFIELD, IL â€“ Lt. Governor Sheila Simon will meet with stakeholders and discuss the ongoing challenges faced by Emergency Medical Services (EMS) personnel in rural communities as host of the upcoming 2013 Illinois EMS Summit in Springfield on Oct. 8. She is encouraging EMS experts and health care providers to register now through next week. The 2013 Illinois EMS Summit organizers tout the event as an opportunity for EMS providers and other rural stakeholders to come together to examine the conditions of rural EMS in Illinois. Participants will be able to discuss potential solutions for ongoing rural EMS challenges such as recruitment and retention of personnel, continuing education requirements and the misalignment of licensure with national standards. Lt. Governor Simon is the chair of the Governorâ€™s Rural Affairs Council (GRAC). As GRAC chair, Simon is leading efforts to combat a shortage of emergency responders in many parts of the state, encourage additional EMS training, and improve various classifications and standards. GRAC also established an EMS subcommittee to enhance existing emergency response units, reduce ambulance response times in rural Illinois and make recommendations for improvements and enhanced access. The summit will be held in Room 1105/1106 of Lincoln Land Community Collegeâ€™s Trutter Center at 5250 Shepherd Rd., in Springfield. Those interested in participating can register online at www.siumed.edu/cme/tracker.html. The registration rate is $15 per person. The fee includes refreshments, lunch, and summit materials. â€œViolence Prevention and You: Law Enforcement and Community Responses to Crime,â€ was the theme for the 5th Annual Unity Conference, held in commemoration of Unity Month. The conference gave participants the opportunity to learn about some of the Stateâ€™s Attorneyâ€™s innovative and creative approaches to reduce violence in our communities. During the conference, Stateâ€™s Attorney Alvarez presented the Community Empowerment Award to Colleen Daley, Executive Director of the Illinois Council Against Handgun Violence for the organizationâ€™s work to reduce death and injury caused by firearms. The Unity Conference was held September 11th at the UIC Forum in Chicago. 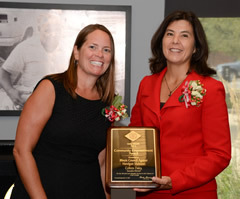 Photo Caption: Cook County Stateâ€™s Attorney Anita Alvarez (right) presented the 2013 Community Empowerment Award to Colleen Daley, Executive Director of the Illinois Council Against Handgun Violence for the organizationâ€™s work to reduce death and injury caused by firearms. CHICAGO, IL â€” Aaron Nicholas couldnâ€™t believe he won a lottery jackpot by re-playing the numbers printed on a Quick Pick ticket he bought for a previous drawing. â€œMy Quick Pick ticket didnâ€™t win that night, but I had a good feeling about the numbers on it so I decided to play them for a week.â€Â The lucky Chicago resident was shocked to win $450,000 when those five numbers â€“ 7 â€“ 12 â€“ 13 â€“ 27 â€“ 32 â€“ came up in theÂ August 20 Lucky Day Lotto evening drawing. As a young boy Nicholas looked forward to attending church with his mother to listen to the choir. He grew up memorizing the tunes and playing them on his keyboard with ease. His natural talent earned him a spot in the church band where he still plays today. Nicholas plans to use his winnings to buy music equipment, pay bills, and donate to his church. â€œI am grateful that my church gave me a chance to pursue my passion. Now I can buy myself a top of the line digital piano and enchant more people with my music.â€Â In his spare time Nicholas also plays in the jazz group, Two Cold, with whom he has produced his first instrumental music CD. When asked if he had any advice for other lottery players Nicholas responded, â€œKeep playing and donâ€™t give up. Anythingâ€™s possible.â€ The winning ticket was purchased at S&J Mobil Oil, 7601 South State Street, in Chicago.Â The retailer received a $4,500 bonus, equal to 1 percent of the prize amount, for selling the winning ticket. Jackpots for Lucky Day Lotto start at $100,000. Drawings are now twice a day, seven days a week with an average of over 40,000 winners every day.Â Thatâ€™s over 250,000 winners in Illinois every week! The Lucky Day Lotto drawing takes place every day at 12:40 p.m. and 9:22 p.m.Â For more information, please visit www.illinoislottery.com. Founded in 1974, the Illinois Lottery has contributed $18 billion to the stateâ€™s Common School Fund to assist K-12 public schools, as well as hundreds of millions of dollars to the Capital Projects Fund. Players must be at least 18 years old. CHICAGO, IL â€“ Celebrity designer Robert Rodriguez will make his debut at Latino Fashion Week featuring his 2013 holiday collection and anticipated 2014 Resort wear collection. Since launching his contemporary label in 2003, Robert Rodriguez has honed his talent for sophisticated, feminine, and tailored pieces for a global audience. Each collection incorporates high-quality fabrics and luxurious details that embody Robertâ€™s refined aesthetic. Exposed to the world of fashion at an early age, Robertâ€™s love for design began with Brigid Keenanâ€™s book on Christian Dior, Dior in Vogue, which proved to be a huge influence on his technique. While studying at the Fashion Institute of Technology in New York, Robert gained recognition among his peers, winning the prestigious Critics Award for Best Designer of the Year. Soon after, he accepted a design position at Christian Dior under the guidance of Marc Bohen and Geri Gerald. In 2010, Robert was inducted into the Council of Fashion Designers of America. In 2012, he was chosen as one of the twenty-four CFDA designers to participate in the unprecedented Target + Neiman Marcus collaboration. Celebrity clients include Eva Longoria, Angelina Jolie, and Heidi Klum. The Robert Rodriguez Collection is available at luxury department stores and specialty boutiques in the United States and internationally. Latino Fashion Week is the only fashion week and tour in the United States created to support the talent of local national and international designer and it the premier resource institution for those in Latino Fashion Industry. Latino Fashion Week, now in its 7th year celebrating The Journey is a timeless celebration of the milestones and accomplishments of our organization since its inception. LFW is a showcase of all that is fashion during the 2013 tour in the cities of Los Angeles, Chicago, Miami and Dallas. The Chicago five-day event includes runway show, celebrity appearances, VIP receptions, Fashion Lounges & Market and much much more. Visit our website at www.LatinoFashionWk.com. EVANSTON, IL – Piccolo Theatre Ensemble’s 13th Annual Holiday Panto for kids and family previews November 8, and this year Piccolo dazzles the senses and sheds new light on an old tale by Hans Christian Andersen. Friendship reflects love and trust, but rejection threatens when the mirror breaks… Christmas is trapped in ice when best friends Kai and Gerda are separated by the enchanted broken mirror of the beautiful but fierce Snow Queen. With the help of her colorful comrades Erick, Derick, and the Dame, the shy Gerda must find the hero within as she quests across wintry Lapland to save the imprisoned Kai, facing trolls, conniving snowflakes, and other magical obstacles along the way. Featuring exciting new music, dancing, and memorable characters, this holiday world premiere will warm your heart, thaw your toes, and make you laugh! The Snow Queen, or When Christmas Freezes Over! is written by Jessica Puller**, with music and lyrics by Rich Maisel, directed by Nicole Keating, and choreographed by Joshua D. Allard** and Vanessa Hughes**. Â Cast includes Joshua D. Allard**, Vanessa Hughes**, Kurt Proepper**, and Nathan Thompson**; with Josh Ballard, Andy Huttel, Claire Hart, Jillian Weingart, Shane Hill, Caitlin Aase, Sarah Mayhan, Shari Mocheit, and Steve Yandell. The Snow Queen, or When Christmas Freezes Over! previews November 8 – November 10 Friday & Saturday at 7:30PM, and Sunday at 3PM. Opening is Friday, November 15 at 7:30PM with a free reception to follow. Performances run November 15 – December 21; all performances are Friday at 7:30PM, Saturday at 3PM & 7:30PM,and Sunday at 3PM. Ticket prices include $15 (previews only), $65 (family of 4), $25 (adults), $22 (seniors), $15 (students), $10 (Children 10 and younger). Group discounts are available for all performances. For tickets and more information, call the Box Office at (847) 424-0089 Monday-Friday from 10AM-5PM, or visit www.piccolotheatre.com. “Magic in the Word”: Revolutionary Book of Acrostic Poetry brings new meaning & depth to lifeâ€™s â€˜everydayâ€™ words. Posted by Admin On September - 30 - 2013 Comments Off on “Magic in the Word”: Revolutionary Book of Acrostic Poetry brings new meaning & depth to lifeâ€™s â€˜everydayâ€™ words. Written by Victor French and believed to be the only book of acrostic poetry currently on the market, â€˜Magic in the Wordâ€™ brings a whole new meaning to words we speak every day. While the bookâ€™s format is revolutionary in itself, the authorâ€™s unique presentation of words is expected to help readers use them in proper context and express their thoughts with gusto. Toronto, Ontario â€“ While hundreds of thousands of poetry books exist to encompass every conceivable topic, Canadian author Victor French has opened a new literary door by releasing what is believed to be the first published book of acrostic poetry. However, it isnâ€™t just an art form; Frenchâ€™s unique presentation of everyday words is a bold attempt to help readers better understand them and express their thoughts with true meaning. â€˜Magic in the Wordâ€™ says it all in its title. Exploratory, entertaining and wholly-unique, the ground-breaking book is poised to resonate with readers everywhere. Some have said that this book should be a COFFEE TABLE “must” because of the quick, easy read of each and every page. The author has captured the inner sense and feeling of everyday words to the point that we may now use these words and know that they are in proper context to express our thoughts. Selected readers, previewing the manuscript, gave the opinion that overall it is a clever, thought provoking and smooth flowing description of a word artfully using each letter that spell the word. You will find some of the work within the pages are the author’s philosophical thoughts, others are enough to tickle the thought processes of the reader, while some are simply amusing. This book is definitely for the young and old – and all those in between – as it reminds us that the words we use each day have a real feeling other than something uttered as we chatter our way through each day with others. The author, in essence, has ventured into a new realm with words and letters that will challenge the readers to let their minds open in a new direction with the simplest of words in daily use. As the author explains, composing his book was quite a challenge. â€œI set out to use every letter of the alphabet, and I achieved it! It was important for me to use everyday words in order to give readers a deeper understanding and appreciation of them. Examples include GOD – HEAVEN – CHOICE – BRAVE -HUMANS – BEAUTY – MOTION â€“ QUEST,â€ says French. With a second book in the works, French is currently hosting a unique competition. Through his increasingly-popular blog, French is inviting all members of the public to submit words for possible inclusion. â€œIâ€™ll tackle anything so, go on â€“ challenge me! Who knows, your word could end up being featured in my next book!â€ he adds. â€˜Magic in the Wordâ€™, published by FriesenPress, is available now: http://amzn.to/1dIRVWt. The book will soon be available through over 25,000 global retailers. For more information, visit the authorâ€™s official website: http://authorvfrench.weebly.com.